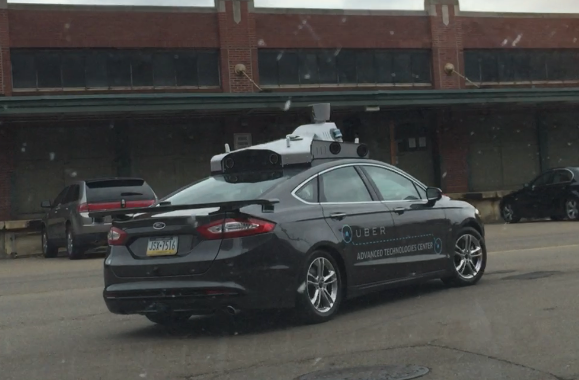 Uber was recently spotted testing one of its "advanced" vehicles on the streets of Pittsburgh. If the massive array of equipment on the roof wasn’t enough to give it away, the “Uber Advanced Technologies Center” wording plastered on the doors would certainly do the trick. The Pittsburgh Business Times was the first to report the sighting. The app-based car service announced plans to develop self-driving car technology this past February. At the time, Uber said it was teaming up with Carnegie Mellon University to build a new facility in Pittsburgh near campus to perform research in the areas of mapping, vehicle safety and autonomy technology. In an e-mail to the publication, Uber spokesperson Trina Smith said the vehicle is part of their early research efforts regarding mapping, safety and autonomy systems. The company later clarified that the car in the photograph was not a self-driving model. Uber is just one of a handful of companies currently testing and developing self-driving solutions for automobiles. One of Uber’s biggest investors, Google, is perhaps at the forefront of the initiative (and also said to be developing an Uber competitor). Its fleet of self-driving cars will be hitting public roads this summer as the search giant expands its testing procedures. Elsewhere, Audi and Volvo are both working on their own solutions while Tesla’s latest vehicle, the Model S P85D, already includes a drive assist feature. I'll have to keep my eye out for it. I haven't seen it driving around here yet. Me too... Oh wait, I can't, maybe it's because I don't live in Pittsburgh, in fact I don't even live in the US. Over here 99.9% of our taxi's are minibus taxi's for moving the masses and I don't think their operators/drivers/owners would appreciate companies like Uber muscling in on their turf, in fact they're highly likely to be shot. It may sound dreadful but I'm serious. We have had a lot of taxi wars here where a lot of people have been killed. I guess competition is not always good. We don't have gun violence among our taxi drivers, but there has been some serious fallout with Uber moving in. Here in Milwaukee you need a special permit to operate a taxi and the govt only gives out a certain number of them. You're allowed to sell them and since there are so few, they sell for over $100,000 each. Then Uber comes in and starts operating without one of these permits. The taxi drivers were pretty upset that they have to follow this special law and Uber didn't. I haven't heard how they're going to solve it. Let's hope it doesn't erupt into violence, there's far too much of that going around already. Nope. It usually starts out by a new operator/driver muscling in on the established operator/drivers turf and stealing his action then all hell breaks loose. Yeah, nobody likes progress when it means it's going to eliminate your job, but that's the way it goes. A bunch of ******* cab drivers aren't going to stop progress no matter how much noise they make. Yup, that's happening right now here in Mexico. And today Uber offered free rides to everyone covering up to $150 MXP in Mexico City. This after son very serious issues with taxi drivers and unions. Rather than look at it as competition, look at Charlie and the Chocolate Factory (the newest one). *SPOILER ALERT* When Charlie's dad got kicked after a machine took his job, he later gets a job at the same company as a technician for the machine that replaced him. Rather than taxi drivers seeing it as competition, this is their chance to merge as their street knowledge is something that a machine can't duplicate. Combining the finest taxi drivers with this newfound technology could benefit both!